« Morgan is Dead! What follows for Congo’s Forests? We built Afarama camp in 1986 for a radio collar study of Okapi in the Ituri Forest. We continued to use Afarama for various studies through the 1990s. 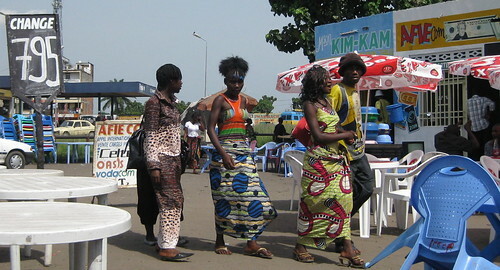 In 1996 the unrest in Zaïre escalated to rebellion. I was in the forest, the Ituri Forest, when I became aware of the fighting. The battles 400 km away seemed remote; however, from the perspective of my husband, John, back in the United States, the Ituri was far too close to the chaos. John was reading the news. If there had been any way to send a message, he would have urged me to leave immediately. My concerns were more local. Miniscule ticks had burrowed into the flesh of my armpits, under my belt and at the tops of my thighs – elephant ticks, we called them – and the whole camp, twenty men and myself, was suffering. We were at our research camp, 20 km north of the nearest road. The rest of the camp, research assistants and field crew from different parts of the forest or from the distant savanna, joked openly about their ticks. They went to the stream to bathe before nightfall and tried to dig them out, sending up shouts of pain and laughter. I took a bucket bath after dark and then in my tiny camp house tried to extract the ticks, one by one, using a kerosene lantern, fine tweezers, and the beam from a flash light propped on a pile of field books. It was the worst tick “invasion” we had suffered in over two years. The Mbuti Pygmies told me that the outbreak was from the large group of elephants that had moved over the study area a week or so earlier. Suddenly the camp hushed. The radio was turned up. The news was on, news from the neighboring province of Kivu. I slipped my shirt back over my head and went out to listen, moving carefully to avoid the quick stabs of pain from the remaining ticks. Not often did the whole camp quiet down for the news. The chorus of evening katydids and tree crickets seemed louder than the radio. Every tree had its callers and the trees rose above our little camp; they spread beyond, on all sides, unbroken for kilometers and kilometers. An owl called somewhere down stream and a hyrax started the mounting wails of its nightly crescendo. The camp hush was transitory. The Mbuti Pygmies, eight were in camp, returned to the central leaf-thatched cooking area where several of them had fish caught at dusk roasting in the remaining embers. The fish were wrapped in leaf packets. Kayo, one of the Mbuti, took up a likembe finger piano, and started to pluck a tune; another tapped out a rhythm on an empty, plastic jerry can. The field crew was made up of at least five different ethnic groups that usually worked as a well-integrated team. 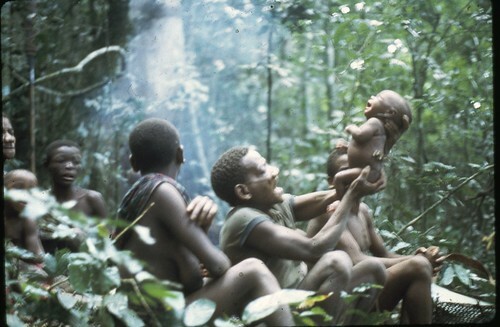 The Mbuti Pygmies were respected for their forest skills, the tree-climbing and animal tracking were essential. Besides, everyone recognized that the Mbutis’ contributions of wild mushrooms, honey, edible fruits or nuts made a simple rice and bean diet palatable. But the Mbuti had little interest in the radio voice. South Kivu was far away, none of them really knew where, except that people going to Kivu drove east, not west, along the single road through the village of Epulu. The big news was in Kivu, and irrelevant to the here and now of the forest. The rest of camp remained still and poised, bent toward the radio. Some sat on low rattan stools by the open leaf roof, a sort of veranda to my stick and adobe one-room house; others leaned against its supporting posts. Liengola, one of my principal research assistants, adjusted a protruding wire from the radio trying to find the best reception. 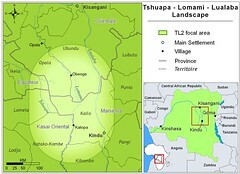 A static broken voice informed us that the Banyamulengi had destroyed the refugee camps near the Zaïre/Rwanda border. Some refugees, perhaps loyal to Rwanda’s old regime, along with Mobutu’s Zaïrian troops, were fleeing west and north. The night before, Kambale, from Kivu, had told us what he saw on his trip home to visit his mother: Mayimayi rebels marauding the countryside, making quick strikes on Zaïrian troops and then disappearing. Those with relatives in Kivu were worried. Everyone, except the Mbuti, listened closely. I’m not sure why the Mbuti were so disinterested. Did they trust that they could disappear into the forest as shock waves road along the road? Or was the fighting too far away to be relevant? Or did they just accept that they couldn’t do anything to change whatever social cataclysm came our way. Any war would affect them, like everyone else. Medical care would disappear. If our project left, so did Wildlife Conservation Society, which was the only source of income for the entire forest crew. Faced with insecurity, Bantu villagers, would plant and harvest less, and ultimately be less generous with the Mbuti. Two weeks after that evening in camp, I left Zaïre. Seventy kilometers down the road, two young soldiers from Mobutu’s fleeing factions stepped out from the forest edge in front of our vehicle, AK-47’s pointed towards us. We froze. They came around to the side window leaving the road clear. Seizing the opportunity, our driver roared ahead. Were those soldiers alone, we wondered? They already had come much farther north than we had expected. Two hundred km further east, at the landing strip in the savanna town of Bunia, heavily-armed, disgruntled soldiers were everywhere. Most were in plainclothes. Was it a sign of their humiliation; were they ready to mingle back into the population? They hurled oaths with the surly habit of their abandoned uniforms. This is where we had expected Mobutu’s army to be re-assembling. They were to be flown to a retreating front line, but the soldiers openly contested their assignment. Loud women clung to idle groups of men, alternately mawkish or bitter at anticipated desertion. We were irrelevant to the drama but our irrelevance did not make us feel safer. 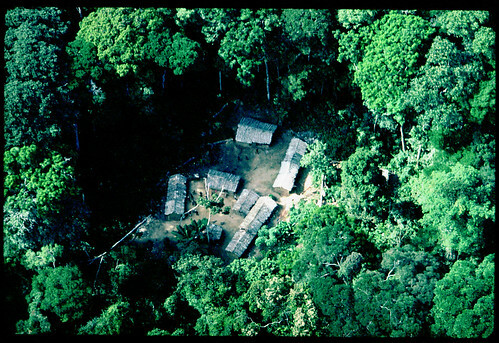 The small missionary plane took off without major problems, but my relief was darkened by the image of the camp crew trying to decipher the future from a radio in the deepening shadows of the forest. Mobutu’s vanquished infantry was fleeing on foot deeper and deeper into that forest. Only four days later I was in New York. Jojo, our youngest daughter, newly seven years old, covered the tiny tick carapaces with Vaseline and Band-Aids while John and I discussed how to help, even how to contact Epulu. Everything had become uncertain: the newly created protected area in the Ituri Forest, our research and training center, the jobs of our crew. Everything could be crushed under advancing war. Zaïre’s history has been tossed from war to war. Even the country’s name, Zaïre, was born from the rebellion of the 1960s that swept through the newly independent Republic of Congo. That war had not spared the villages of the Ituri Forest. Before that, for the previous half a century the same land, then a colony, was the Belgian Congo. And the Belgian Congo had first been King Leopold II’s Congo Free State, also established through war in the late 18th century, war against the Arab ivory-hunters. That war, too, had gone right through the Ituri Forest. Belgium’s King Leopold II never set foot in his Congo Free State, but expanded his holdings to include half of Africa’s rain forest and most of the Congo Basin. A couple decades earlier, John and I knew nothing of Congo’s wars. It was a different war that brought us to Congo, then Zaire. The Vietnam War seemed far from Minnesota where we were college students, electric in the glory of being who we were. The war spread a faint acrid breath over the greening of Spring. With other students, we staged anti-war strikes; we marched through St. Paul’s streets; we held rallies and sit-ins. Still the war was distant. I had met John in this small-town south of Minnesota’s Twin Cities at Carleton College. It was 1970 and 1971, and it was Spring. He was a bird watcher and bird bander. I met him on a hilltop where we both had wandered during our separate walks. The rural bottomlands of the Canon River were leafing out and spread at our feet. Soon I was more concerned with the wingbars of warblers than the slayings around Saigon. The two of us, John and I, slipped out at dawn to walk the woodlot borders and peer into hedgerows as, just beyond, the eastern rim of the cornfields burst into golden morning. I was enchanted by warblers’ wardrobes, by the brilliance of indigo buntings and tanagers, and by the skittering grace of kinglets. “That was a blackburnian”, John would volunteer as I gazed intently but unseeing after an insistent trill from the willow leaves. 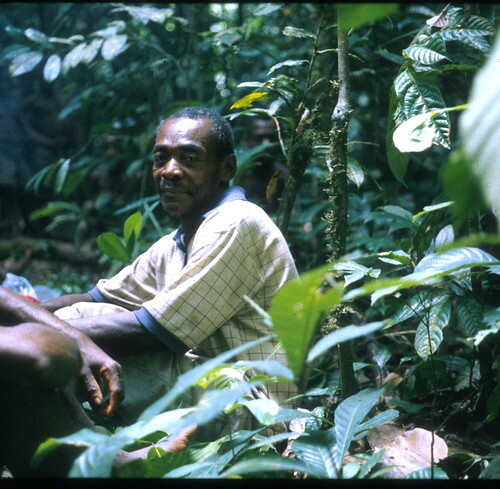 Kenge in the Ituri Forest, near Epulu, in the 21st century. To John and me this seemed relevant: they know the forest so well that they neither need nor want anything else. This was a perfect vision for a generation that doubted the material wealth we grew into and felt thrust us into a war on the other side of the world. A photo taken by John on the hunt with Mbuti in the southern Ituri Forest in 1973 or 1974. The Forest People discussion that I remember most clearly occurred one Spring morning on the wooded bluffs of the Canon River. John and I had taken off at dawn with binoculars and a bread and cheese breakfast. We bicycled east out of town. The bluffs grow oak on the summits and shady stands of maple and basswood on the moister slopes. We wandered the edges until captivated by a snipe winnowing through columns of morning over an open valley meadow. We sat on the slope to eat our bread and watch the bird catapult itself high above the surrounding ridges to invisible heights. Then with tremulous, bleating whir it plunged back to its swale. With reckless abandon it mounted again and again. This discussion had a mandate. John had learned of a fellowship, the Watson Fellowship, that provided finishing undergraduates six thousand dollars for a completely self-guided year-long project of their dreams. I was cross-legged on a mat of moss and leaves. John gesticulated from a fallen log. The bread and cheese was set between us on a plastic bag. I learned few details of the award- it was the plan that was important. John was enthralled. Think of what could be learned from a year with the Mbuti Pygmies in the Ituri Forest of Zaïre. Grantees must leave the United States, which was just what John wanted to do. Recipients were chosen on the basis of essays and interviews. Would John be able to pare this to a two-page essay? John held a lump of cheese dramatically off to the side as he started through a long list, swept the cheese over our heads as his list went on. His eyes flashed; he was already in the Ituri, but he cut off mid-sentence to grab his binoculars. The snipe rose above the valley. We fell into complete silence. When the snipe was again quiet in the reeds and grasses, the Ituri plans restarted exactly where they had left off. John tossed the cheese in his mouth. He would learn Swahili and important local languages. He would take binoculars, tape recorder, scales for weighing and tapes for measuring. The excitement was infectious. There was much that Colin Turnbull assumed, that really needed verification. Was it true that the forest was so bountiful there was no need for ownership or aggression? How important was hunting? Gathering? How important was trade to the Mbuti? Were they really as independent as Turnbull insisted? Turnbull thought that he had seen the end of an era. He encouraged John, but Turnbull was certain Congo after the rebellion held less opportunity and less freedom for the Ituri’s Mbuti Pygmies. John left for Kinshasa, the capital of Zaïre, in January 1973. I was still at Carleton. I applied to Peace Corps, certainly more “relevant” than graduate school. I was accepted and given the assignment of Zaïre. John’s letters told me he was already in the Ituri Forest. I delayed a year, it seemed too much like a pre-written script to follow on his heels. Instead I worked at a cash register that year after Carleton, and studied my French. John’s Watson Fellowship stretched well beyond the intended 12 months. When I finally arrived in Zaïre, he was 18 months into it and still in the Ituri Forest. 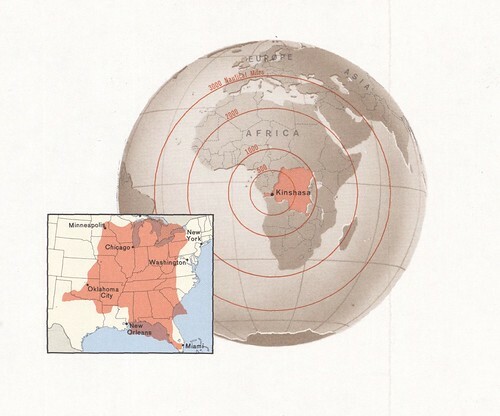 Peace Corps informed us that Zaire was as big as the USA east of the Mississippi River. In the capital of Kinshasa, our cohort of Peace Corps volunteers quickly learned, that this country was still living in the aftermath of its rebellion, the war truly had transformed Turnbull’s Congo. Vietnam, on the other hand, was “our war”. I heard of it only in reference to the piles of second hand clothing sold in the open-air markets. “Ma-Vetenam” they were called, a confusion of the French word for clothing, vêtements, and the radio word for foreign war, Vietnam. A common belief was that the clothing had been stripped from the slain in America’s Asian war. Like John, I soon bought from these abundant and cheap piles of cast-offs. The clothes were shipped in bales from New York’s harbors, a port equally as foreign as the mouth of the Mekong. Kinshasa in the 21st century. Photo from car window. Our group of 60, green Peace Corps volunteers were quickly shipped to the east where we had six weeks of training. A year and a half earlier, John had spent a month in Kinshasa. He couldn’t travel up the Congo River (then Zaïre River) and into the forested interior until he had the appropriate government authorizations. He was on his own whereas I was part of an American government program. John spent long hours in Kinshasa’s crowded waiting rooms. He got to know the city’s contradictions: the high ceilings of airy colonial architecture humbled by the tattered remnants of drapery at windows and threadbare carpets on the floor. More than once he’d waited most of a day, sunk deep in a worn sofa or perched on a cracked plastic chair, practicing his Lingala greetings on idle petty officials. Then, when it was certainly almost his turn, the critical official would be called away urgently. An expatriate Belgian once emerged from a side office, sympathetic, caustically so. He opened the door for John and they walked out into the dusty street together. The Belgian noted that the Belgian Congo had not been like this. This new Zaïre was corrupt and inefficient. If it had been as before independence and the rebellion, he, the Belgian, would have marched John’s papers through. John would now be traveling up-river to the Ituri. They crossed the street together to one of the little tin shacks selling coca cola, beer and orange Fanta. The Belgian’s mouth was a tight bitter line. John smiled, asked questions, split a beer but turned down the invitation for a long evening of many more beers. Ten years had not yet passed since the war following independence, but to John rebellion politics seemed unimportant bits of history when what was truly interesting was the timeless waiting forest. John was reminded, again, of the rebellion by his night companions, the watchmen at the missionary guesthouse where he stayed. He spent early mornings and early evenings bird watching on the banks of the great Congo River, practicing his French and Lingala. There was little Swahili this far west. He talked with fishermen. He climbed to the top of one of the banks and gazed up the broad flat river. Up there far beyond this savanna and river culture was the Ituri Forest. He talked to the vendors who sold cigarettes at the ridge top street corner or the Mama Commerçantes who joined the vendors at noon to sell roasted corn or leaf-wrapped, fermented cassava. But in the dark of an equatorial nightfall, John joined the night watchmen, Daniel and Albert, around their small fire. Each night a silence enveloped this riverbank city. Bats were abundant and a chorus of evening insects sang from a blackness rarely punctuated by electric lights. Albert’s cigarette burned brightly, but Daniel’s flashlight was dismembered, its batteries propped close to the fire, supposedly being recharged by the heat. Daniel lectured John about wearing shorts. John should not wear shorts. “Why not?”, John wanted to know. It was self-evident. It showed no respect. But why not? Les “colons”, les “belges” wore shorts along with a jungle-style pith helmet and high leather boots. The colonial voice was imperious and the right-hand men, native hirelings of some other tribe, made sure his wishes were carried out. We entered Zaire through its capital, Kinshasa, and then went east. 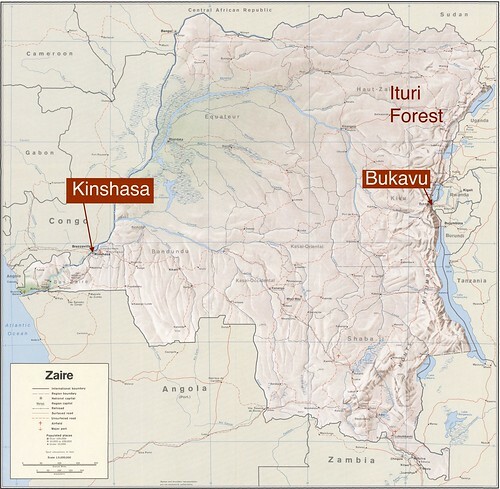 We, Peace Corps volunteers, were all flown to the training session in the Swahili-speaking town of Bukavu; it was set in the mountains of the eastern rim of the country and not far, on the map at least, from the Ituri Forest where John had already been for more than a year. During the 1960s this eastern third of the country was outlined in red on maps at the United Nations and in Washington DC. It was here that the rebellion had raged longest and hardest, and here that ragged armed bands walked to exhaustion down long forest roads and raged brutally but ineffectually from mountain corridors. Every morning, by 6:30 AM I was swimming in Lake Kivu at the foot of the hill where Peace Corps had taken over the facilities of a boarding school on holiday. Squatting, shivering a bit on the dock with my arms tight around my knees, I could look north over the flat waters. Perhaps less than 300 km now separated John and me but the last that I had heard from him was a letter a month earlier in New York and now there was no phone service, not even any internal national mail service. At the north end of the lake were the volcanoes with gorillas and then, farther north, although I could not see it, was the Ruwenzori Mountain with snow-covered peak on the equator. Somewhere west of the Ruwenzori, down in the forest, was John. I wandered the town of Bukavu with other volunteers. During the colonial period, the part of town with our boarding school had been for Belgians, white merchants and government administrators. The streets were wide; red brick and stucco houses sheltered under flowering trees and the gardens were still large and exuberant. The gardeners, after all, were still here it was just the colonialists who were gone. But there was no bitterness, at least not towards us. As we walked the streets, people stepped forward to shake our hands. Children clustered around us, and older men, usually in tattered shirts and barefoot, drew themselves into elaborate colonial salutes. We volunteers, also, apparently were part of the new Zaïre. People thought we would make a difference. One of our local Zaïrian instructors, Paluku, a student at the college-level Institut Supérieur smoked ‘Zaïre’ cigarettes. When I commented that the brand name was evidence of national initiative he smiled forbearingly. They are exactly the same as the ‘Belga’ cigarettes that we smoked before the rebellion, he told me. In fact, he added with a wry grin, the same Belgian company, with its central office in Antwerp, manufactures the new brand. Paluku was both knowledgeable and intellectually eagert. He used our classroom French lessons and the very simplified Swahili we were struggling to learn, to describe his view of the new country and its immediate history. He told how back in the hills many plantations that had belonged to colonialists, some of coffee, some of tea, were now abandoned. They had been nationalized, turned over to Zaïrian absentee owners who hoped for revenue, but had no interest or imagination for the management required. Paluku, himself, came from the forest northwest of where John now was. During the rebellion he and his family had fled with Pygmies. They built temporary villages and cut temporary gardens into the forest with the hope that they would be able to harvest the yams and cassava before fleeing again. Paluku, with a twinkle in his eyes and a sure swing in his unhurried rotund form, spoke without illusion about the new Zaïre’s pretensions. But he had high hopes. He, his classmates at the Institut Supérieur, and all the youth of Africa’s rich and vast center would rise up and pull the country with them. Every sign indicated success. Zaïre had gold, uranium, copper, and rich farm lands. Navigable rivers stretched into remote wealth. Zaïre was ascending. I was a month into my Peace Corps training before John and I had our first reunion in Zaïre. Perched on top of a truck’s cargo of beans and cassava flour, John rode with a bevy of other passengers south to Bukavu. It had been more than a year and a half since we had seen each other. It was a Sunday evening; I was lingering at the table after dinner helping one of the other stagiaires with his French. My sneakers were still caked with the cracking red mud left from a Sunday exploration in the hills above the city. I had walked with two other volunteers from village to village, rather like pied pipers, trailing a string of excited schoolchildren. Slowly repeating a French conjugation, I glanced into the sitting room just as a shock of sandy auburn hair and a jaunty gait ambled through the door. Same grin, same sparkling eyes, a little thinner. The French review was abruptly terminated, and I was soon swimming in a torrent of John’s excited exclamations and explanations, part Swahili, part French, and finally English. I remember the following week only as scattered fragments. We picked up the intense discussions as though we had just left off on the bluffs of Minnesota’s Canon River, but now John could query his year of experience in the forest to answer the old questions and ask new ones. We walked around Bukavu together, and I marveled at John’s fluent Swahili. Swahili was a must: I, too, must speak easily with everyone. Several nights we talked till dawn, with brief pauses only to listen to Pygmy songs John had taped; at dawn we swam Lake Kivu and then walked up the bank still talking. Had life really changed in the forest as Turnbull predicted it would? Not really, John thought, not because of the war. The war had simply swept through, perhaps made life more difficult. Now, for instance, the closest roads were no longer maintained. No, the real change would come gradually from the east. Population pressure in the eastern highlands was increasing. Slowly more and more farmers were moving down, cutting gardens into the forest. What would become of the Mbuti as the forest disappeared around them? How far could they retreat before encountering the outer edge of another agricultural expansion? One day I skipped classes, and John and I first rode a dilapidated bus and then hitched a ride in the crowded back of a pickup all the way to l’IRSAC, a research institute built by the Belgians in 1947. No Europeans remained, but the shadows of elegance and intellectual prestige faded slowly. An old Zairian curator in baggy ill-fitting pants and smelling of palm wine showed us around the mammal museum. There were skins of genets, okapi, primates and forest antelope. He showed us skeletons, bird specimens and dusty range maps. Nobody was working with any of the collections. Nobody was referring to any of it. These were the vestiges of the Congo that Turnbull would have known, know-how and vigor with a Belgian mandate to collect, explore and understand the colony’s forested vastness. Now, after the rebellion, nothing yet replaced that possessive intellectual energy. Turnbull was no colonial administrator. His approach was American, brash immersion. He was a contrast to the European, cataloguing anthropologists. Yet after the rebellion of the 1960s he feared that what he loved would be lost. He knew the Belgian colony, but not what would come after it. Without a protecting colonial hand, he feared rampant modernization and loss of traditional values. He feared transformation of the forest itself. John and I went to the old guesthouse at l’IRSAC and had a magnificent meal. We were the only guests, and were attended impeccably by a cortege of now idle, rarely paid servants. We felt like grand colonialists. Then, hitching rides, we bumped, jostled and swallowed dust all the way back to Bukavu. This entry was written by Terese Hart, posted on 2014-06-14 at 9:20 pm, filed under Ituri Story_memoire. Bookmark the permalink. Follow any comments here with the RSS feed for this post. Post a comment or leave a trackback: Trackback URL. Its great to read your memoir, Mama T! Thanks for writing. Joel, It feels a bit self indulgent to write all this down… but looking back on the years — it will mainly be about 1980 – 1983 and earlier history — I see how easily our particular perspective could just be lost, and I don’t want that. Smiles. Terry,I didn’t know you met at Carleton.I thought you met in Zaire at Nyankunde or something.Boy did I have it wrong.One of the girls went to Carleton-Becca? After reading no 6 I read up on Turnbull. He was quite a guy too and what a life he led.I don’t think he is ,was,related to my daughter in law’s family though I could be wrong.They are very respectable and pretty straight and religious (not my da. in law) and might not take kindly to Colin T’s life style. Can’t wait to read part 2 Mama T!